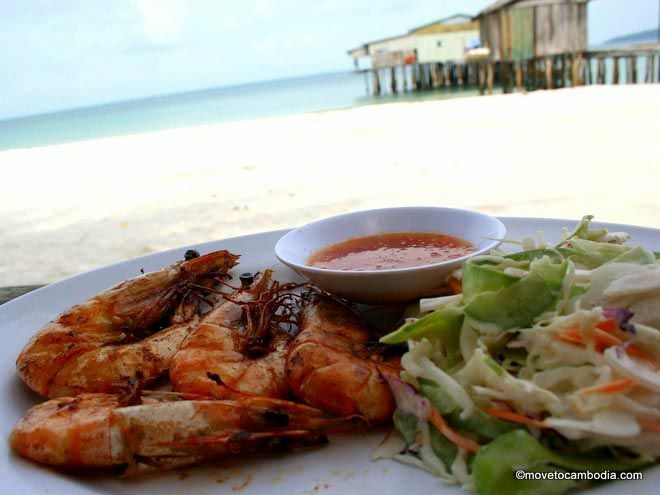 As Koh Rong gets more popular, there are more and more food choices on the island. It’s a sad truth that popular tropical islands too often have inferior food. 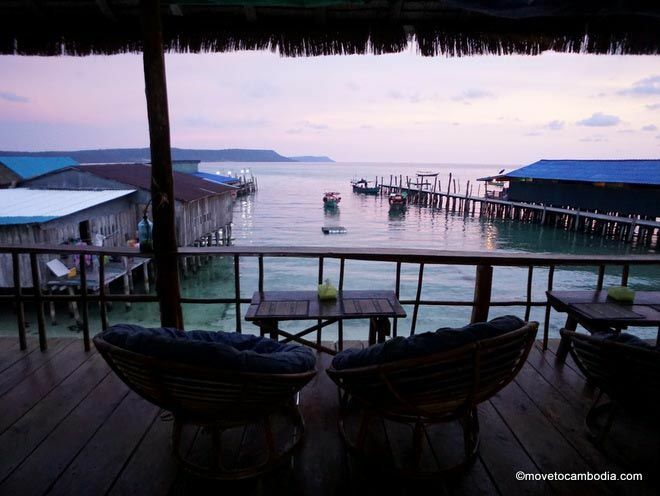 Luckily, there are still pretty good dining options on Koh Rong and all are relatively inexpensive. You can’t Koh Rong with local seafood! The island has very few stand-alone restaurants, but almost all of the bungalows and guesthouses have their own restaurants or cafes, and you can eat at them even if you aren’t staying there. If you’re staying in Koh Toch Village or on Koh Toch Beach, you’ll have more than enough choice, but if you’re elsewhere on the island, for the most part your only option will probably be the guesthouse in which you’re staying, because you’ll be too far from anything else. 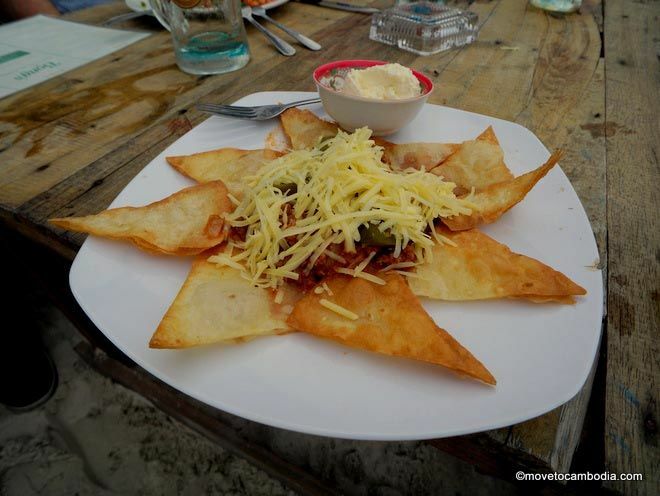 There’s a surprisingly good selection of Italian food on Koh Rong, the result of a wave of Italian immigrants who have passed through Koh Rong. At Treehouse Bungalows an Italian chef built a wood-fired oven to make pizzas. He has since left, but the pizzas remain and they’re pretty good. On the third pier closest to Koh Toch Village is Da Matti? (the question mark is theirs), an Italian restaurant formerly called La Mami, now under different, but still Italian, ownership. With the name change came the addition of a reggae bar, that incongruously complements their menu of homemade gnocchi, ravioli, and other traditional Italian pastas and interesting cocktails. Read our full review of Da Matti? here. Pizza from Treehouse Bungalow’s wood-fired oven. Bamboo has a menu that consists entirely of pizza and booze. They have a wood-fired oven and claim to make the best pizza on the island. We don’t know if that’s true, but they are pretty good. A pizza for one costs between $5.50 and $7 and comes with a free drink. 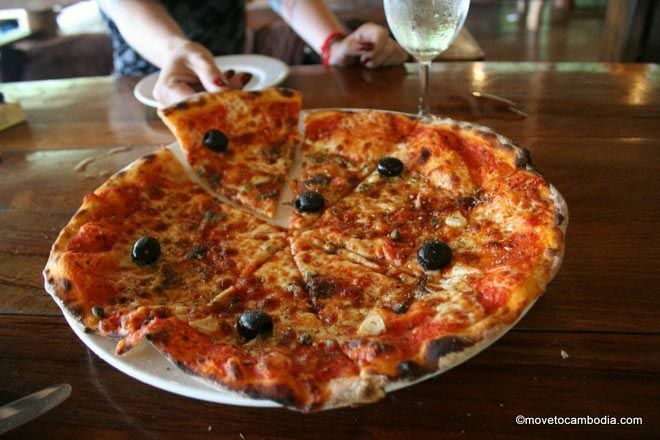 Koh Lanta offers mostly European fare with burgers and pizza (from an “eco-friendly non-wood-fired” oven). They have friendly and attentive service along with parasol-shaded seating in front, and an ice-cream stand serving banana splits that go down a treat on a hot day. We were impressed to see that the ice cream hadn’t melted and been refrozen — a common complaint in Cambodia. On the beach every night there are several same-samey barbeques popular with backpackers, where you can get a piece of barracuda or a chicken leg, a slice of roasted potato, and a small salad for a couple of bucks. If you are more interested in local food, Elephant Guesthouse on the beach has some very nice soups and curries, albeit with the most sullen teenaged waitresses you’ll find in Cambodia. On the pier, Chai Family Restaurant serves Khmer favorites such as noodle soup, fried noodles, pork and rice, and strong, sweet iced coffee. 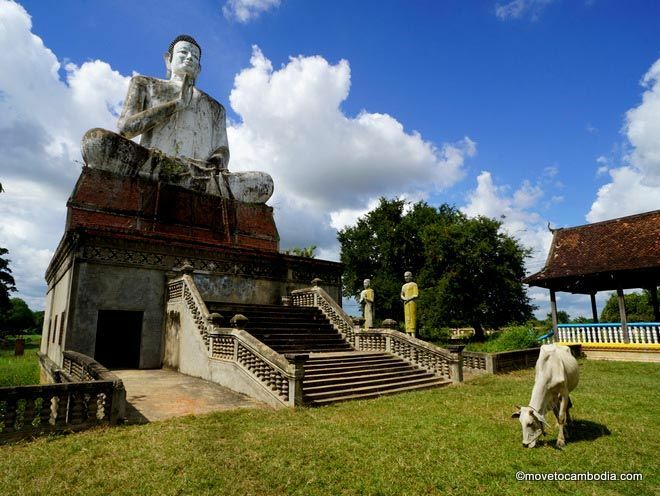 Monkey Island is known for their British pub food, and their prices aren’t any more expensive than they are at Monkey Republic on the mainland, which is sort of amazing considering they need to transport everything from Sihanoukville. The manager Paddy’s Thai wife, V, also cooks up amazing, authentic Thai curries that are worth a try, although you’ll have a hard time finishing the massive bowl. The Rising Sun has Koh Rong’s only dedicated vegetarian and vegan restaurant, with lots of options that even non-vegetarians will appreciate. Every day they have a new daily special and soup of the day, all reasonably priced. Yummy nachos from Bong’s, for when you want to pretend you aren’t on an island. Bong’s has excellent Tex-Mex fare that is truly delicious by island standards, as well as a friendly beach-pub vibe and seating on the beach. They make their own tortilla chips, and the meat-heavy nachos are a real treat. They also have a menu of Western and British food. Paradise Bungalows has a lovely restaurant that’s got the best atmosphere on the island, with beautiful bamboo lighting, recycled teak furniture, and pillows for lounging. Their menu has a decidedly European feel. 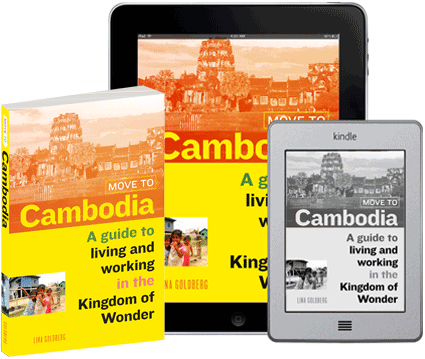 The owner, Rudy, hails from Germany and you’ll see a few German specialties on the menu, as well as many local Khmer favorites. Paradise also has the island’s best selection of wines. For breakfast, check out White Rose Guesthouse. They serve giant bowls of fruit and yogurt and other Western favorites such as pancakes and sandwiches. Dream Catch Inn also has really tasty breakfasts. Try the shakshouka, a delicious Middle Eastern dish of eggs poached in a tomato-and-chili sauce. If you fancy some authentic Thai street food, go up the lane just after White Rose Guesthouse to find Sigi’s Thai Food. Here Sigi — a Thai native who made his way to Koh Rong a couple of years back — serves up dishes of pad see ew and pad Thai from behind a large stall with bar seating. The menu is limited but each item will only set you back a couple of bucks. Note that he closes in the afternoon between lunch and dinner, so don’t expect to be able to get a mid-afternoon late lunch of drunken noodles — you’ll have to wait until 6 p.m. when he reopens. Buffalo is on the pier right next to the Speed Ferry Cambodia office, giving travelers something to do while waiting for their boat to arrive. They offer a nice Turkish breakfast — a variety of small dishes including feta, a hard-boiled egg, peppers, honey and bread — as well as generously filled sandwich wraps and pizza that can be purchased by the slice. Their WiFi is decent, by island standards. Happy hour runs from 5 to 9 pm, with draft beer for 3,000 riel ($0.75). At the moment Buffalo is burned down, but they are in the process of rebuilding. There are a few minimarts near Koh Toch pier where you can buy drinks, snacks, and other bits and bobs, although, island-style, they have a limited (and often overpriced) selection. The shop at White Dragon has the widest selection of goods, including helpful items you might have forgotten, such as diapers or a Frisbee. Phoenix Minimart offers water bottle refills for 50 cents. Nest has brought gourmet fare to Long Set Beach. We now feel guilty for slamming the food at Nest, which we were disappointed by when they first opened. So we were happy—nay, delighted—to discover that they’ve brought on an accomplished and enthusiastic Czech chef who has transformed the menu so entirely that when your meal arrives you’ll have a hard time believing you’re on an island. We tried the Khmer fried chicken (KFC, get it?) 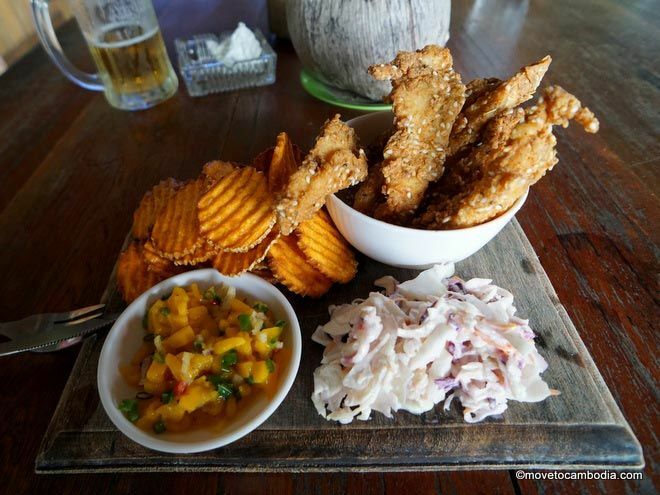 served with freshly made sweet potato crisps, mango salsa, and crunchy slaw and we can easily declare it the best grub on Koh Rong. Sea and Lake is another new place on Long Set Beach that’s mostly a restaurant and bar, but also has a few tents for rent for those looking to camp on the beach. The owner, a Cambodian chef who worked for many years in Thailand, has created a menu that is almost entirely Thai, and to our admittedly ignorant eyes, totally authentic (we were swayed by his use of the actual Thai names for dishes). Open 9 a.m. to 9 p.m.
Long Set Resort has a menu that features very reasonably priced authentic and delicious Cambodian fare, including curries, salads, and stir-fries. We hear that the Western dishes are good, too, but we didn’t try them. They also serve $3 cocktails that might be classified as “too creative” but save you from having to make the long walk to Nest. They also have free WiFi. White Pearl Beach Restaurant and Bar is a new stand-alone restaurant on Long Set Beach that specializes in both Thai food and massage. The menu, although a bit bland in its presentation, offers an appealing choice of Thai curries, soups, and noodles, as well as a few Western dishes. They’re open from 8 a.m. to 10 p.m. (or later, if you want, the staff assured me) and they have free sunbeds on the beach for customers. They also have an attached massage business where you can get a massage while gazing at the sea. A Roman couple started Pura Vita Resort and although they have now left Koh Rong, their former business partner has continued making their recipes. It’s debatable whether the food is as good as it was. Nonetheless, Pura Vita is located on a gorgeous stretch of beach and wandering over for lunch isn’t a bad idea. Be prepared for a long wait and no fan. Hit Eat Pray Love at dusk to enjoy the Sok San sunset. The Moon is one of the only tourist-oriented restaurants in Sok San Village — “they are on TripAdvisor!” a local told me proudly. The menu is specializes in Thai and Khmer dishes, but they also have Western breakfasts. We tried it and weren’t particularly impressed with the food or service, but we heard so many good things that we’re assuming it was an off night. One of the few foreign-run businesses in Sok San Village, Eat Pray Love is an Italian restaurant and pizzeria that has some of the best sunset views in town from their open-air upstairs dining area. They serve a range of pizzas and pastas, including fresh-made gnocchi, made with a range of local and imported ingredients. We were intrigued by their pesto, made with holy basil and peanuts.